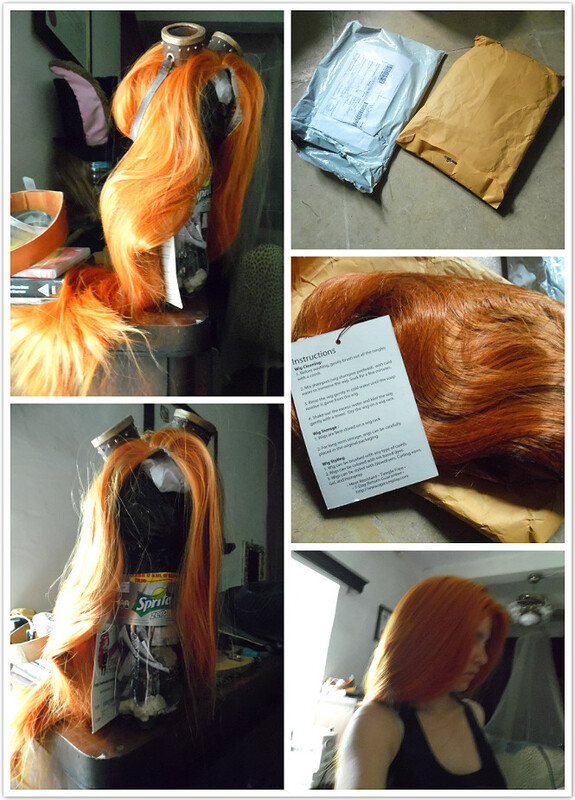 The Merida wig is DONE! Yay! And now I'm going to share with you how I styled it. I had very little idea how to curl wigs, so I experimented with making rollers out of paper. That didn't work so well, mainly because I tried to curl from the bottom layer of wefts up, not from the top layer to the bottom. Next I tried using a curling iron, which was more successful. I recommend using a curling iron that has a clip to help hold the hair while you curl it, because you may risk burning your fingers with a 'wand' style curling iron. Curl from the top to the bottom, section by section. You can curl large sections, or take small pieces from each weft layer. This will give you a variety of curls, which will emulate Merida's messy hair. The actual curling it quite simple. Take a section of hair, and wrap it round the curling iron (or use the clamp/clip a hold the hair in place, then turn the curler around and around). Keep it on low to medium heat. Hold it for a few seconds. 30 seconds is ideal. After 30 seconds, gently release the hair from the curling iron. Try and catch the hair so that it remains rolled up. Take a hair pin or bobby pin, and use it to pin the curl of hair to the top of the wig. Repeat this step over and over. You might find that the hair slips around when you are trying to curl it. You can spray some water on the strand, which sticks the fibres together, making it easier to curl the strand of hair. To keep the curls in place, lightly spray them with hair spray. This is how the finished wig should look. The only thing I don't like about mine are the frizzy bits at the bottom of some the curls, caused by trying the separate the fibres from each other. I'm not sure if the curl would survive being being, so keep that in mind if you need to wash or dye the wig. Also note that curling will make the wig look shorter, because much of the length will be in a helix shape rather than straight. Try and buy a longer wig to stop it becoming too short.